Flam. Sol. 1 H228 Flammable solid. Water-react. 1 H260 In contact with water releases flammable gases which may ignite spontaneously. H260 In contact with water releases flammable gases which may ignite spontaneously. P210 Keep away from heat/sparks/open flames/hot surfaces. No smoking. P231+P232 Handle under inert gas. Protect from moisture. P370+P378 In case of fire: Use for extinction: Special powder for metal fires. P402+P404 Store in a dry place. Store in a closed container. Supply fresh air. If not breathing, provide artificial respiration. Keep patient warm. Special powder for metal fires. Do not use water. Wear protective equipment. Keep unprotected persons away. Store in a cool location. Store away from acid chlorides. The product does not contain any relevant quantities of materials with critical values that should be monitored at the workplace. Follow typical general protective and industrial hygiene measures for handling chemicals. Sublimation temperature / start: No data available. Contact with water liberates extremely flammable gases. Ignition temperature: No data available. Auto igniting: No data available. In contact with water releases flammable gases which may ignite spontaneously. Do not allow undiluted product or large quantities to reach ground water, water course or sewage system. Consult state, local or national regulations to ensure proper disposal. 4.1 Flammable solids, self-reactive substances and solid desensitised explosives. All components of this product are listed on the Canadian Non-Domestic Substances List (NDSL). Terbium (Tb) Nanoparticles, nanodots or nanopowder are black spherical high surface area particles. Nanoscale Terbium Particles are typically 10 - 80 nanometers (nm) with specific surface area (SSA) in the 30 - 60 m2/g range. Nano Terbium Particles are also available in passivated and Ultra high purity and high purity and coated and dispersed forms. They are also available as a dispersion through the AE Nanofluid production group. Nanofluids are generally defined as suspended nanoparticles in solution either using surfactant or surface charge technology. Nanofluid dispersion and coating selection technical guidance is also available. Other nanostructures include nanorods, nanowhiskers, nanohorns, nanopyramids and other nanocomposites. Surface functionalized nanoparticles allow for the particles to be preferentially adsorbed at the surface interface using chemically bound polymers. See more Terbium products. Terbium (atomic symbol: Tb, atomic number: 65) is a Block F, Group 3, Period 6 element with an atomic radius of 158.92535. The number of electrons in each of Terbium's shells is [2, 8, 18, 27, 8, 2] and its electron configuration is [Xe]4f9 6s2. 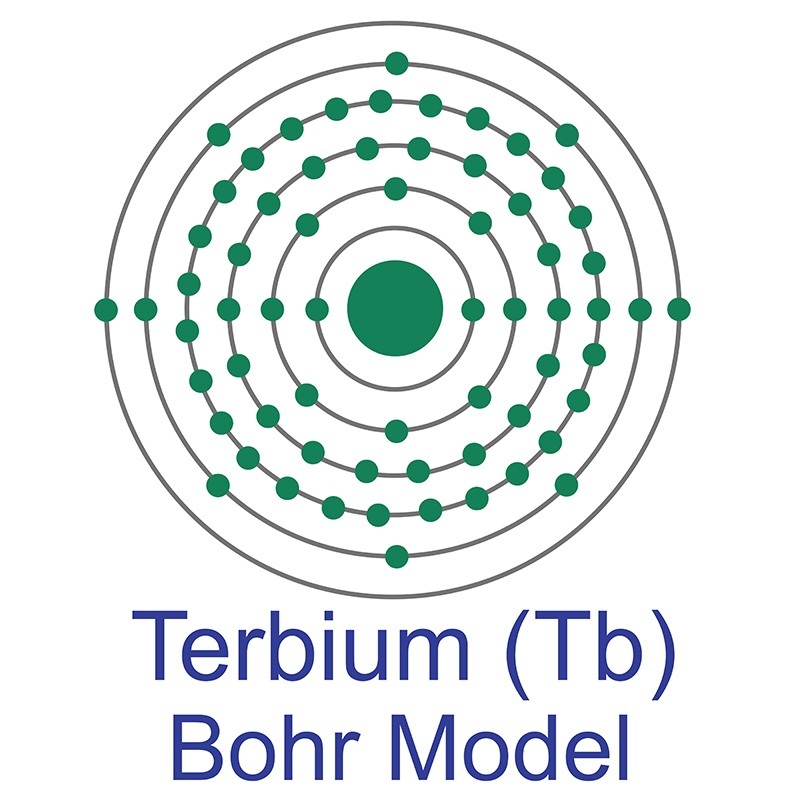 The terbium atom has a radius of 177 pm and a Van der Waals radius of 221 pm.Terbium was discovered and first isolated by Carl Gustaf Mosander in 1842. In its elemental form, terbium is a silvery-white soft metal. Terbium is found in cerite, gadolinite, and monazite. It is not found in nature as a free element. Terbium compounds are brightly fluorescent, and a majority of the world's terbium supply is used for creating green phosphors that enable trichromatic lighting technology. It is also frequently used as a dopant for crystalline solid-state devices and fuel cell materials. It is named after Ytterby, the town in Sweden where it was discovered. Carbon Dots and Terbium Co-Enhanced Fluorescence of Europium Nanoparticles for Cell Imaging. Reversible Response of Luminescent Terbium(III)-Nanocellulose Hydrogels to Anions for Latent Fingerprint Detection and Encryption. Direct determination of graphene quantum dots based on terbium-sensitized luminescence. Synthesis of Au nanoparticle-decorated carbon nitride nanorods with plasmon-enhanced photoabsorption and photocatalytic activity for removing various pollutants from water. Graphene quantum dots-terbium ions as novel sensitive and selective time-resolved luminescent probes. Synthesis of oxide-free aluminum nanoparticles for application to conductive film.